AdvantEdge validates continuing client-centered commitment to information transparency, safety and security for its clients. WARREN, N.J. September 27, 2017 AdvantEdge Healthcare Solutions (“AdvantEdge”), a leading healthcare billing, coding, and practice-management company, today announced its completion of the third-party Statement on Standards for Attestation Engagements No. 16 (“SSAE 16”) System and Organization Controls Report (“SOC 1®” Report) Type 2 and SOC 2® Type 1 examinations. These completed certifications mark another milestone for AdvantEdge, validating its commitment to deliver high-quality services and informational security to its clients by operating at the highest level of transparency and standards. SOC 1 for service organization focuses on internal control over financial reporting (ICFR) and reports on controls at a service organization relevant to user entities’ internal control over financial reporting. SOC 1 Type 2 examinations report on the fairness of the presentation of management’s description of the service organization’s system and the suitability of the design and operating effectiveness of the controls to achieve the related control objectives included in the description throughout a specified period. 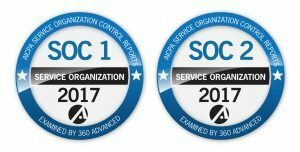 SOC 2 for service organizations focuses on trust services criteria and reports on controls at a service organization relevant to security and confidentiality principles set forth in TSP 100. The SOC 2 Type 1 examinations report on management’s description of a service organization’s system and the suitability of the design of controls. The examination was performed by 360 Advanced, Inc., a full-service audit firm that specializes in integrated compliance solutions. The SOC 1 and SOC 2 examinations are attestation standards issued by the American Institute of Certified Public Accountants (“AICPA”), and both reports have been issued under SSAE 18, the most widely recognized authoritative guidance that provides service organizations a uniform method for disclosing independently assessed information about the design and operation of internal controls related to their services. AdvantEdge is recognized as one of the top 10 billing, coding, and practice management companies in the U.S., with more than 600 employees, collecting over $1 billion annually for physicians, hospitals, ambulatory surgery centers, behavioral health agencies and large office-based medical groups. AdvantEdge has added value to physician practices and healthcare organizations through its billing, coding, practice management and business analytics solutions for over 50 years. AdvantEdge’s clients enjoy improved financial results through its tailored services, robust technology and actionable business intelligence and reporting tools. AdvantEdge’s promise: More money faster, Client-First Service, Compliance, Privacy & Security and anytime anywhere access to data and information. AdvantEdge’s investors include Safeguard Scientifics (NYSE:SFE) and Founders Equity. For more information about AdvantEdge, please visit our website at www.ahsrcm.com, follow us on Twitter at @DoctorBilling and on LinkedIn.